Celebrate I Love NYC Pets Month with the Mayor's Alliance! - Out of the Cage! Celebrate I Love NYC Pets Month with the Mayor’s Alliance! Every February, in honor of Valentine’s Day, the Mayor’s Alliance for NYC’s Animals presents I Love NYC Pets Month to shine a spotlight on New York City’s homeless animals and encourage more people to adopt a furry family member. 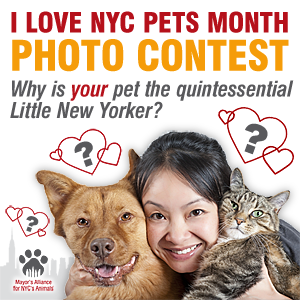 Is your loveable pet the quintessential NYC pet? If you think so, then share a photo of your pet with us this month for a chance to win a fun prize! This photo contest runs from February 1 through February 28, 2012. Each winner will also receive two limited edition Mayor’s Alliance I Love NYC Pets SocialPakt t-shirts — you pick the sizes. 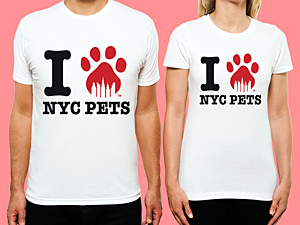 Between February 1 and February 29, purchase an I Love NYC Pets t-shirt, designed exclusively for the Mayor’s Alliance by SocialPakt, and support NYC’s animals. The original design by NYC-based artist Charlie Tsampa evokes one of the globally recognized emblems of New York City and can be proudly worn by anyone who loves animals. It will make a great gift for Valentine’s Day, and a memorable way to acknowledge your support of Little New Yorkers all year long! Be sure to order online by February 5 for delivery by Valentine’s Day. These tees are available in adult sizes only. They retail for $20.00 each, and the Mayor’s Alliance receives $6.00 from every sale. Open Your Heart to a New Love! We can think of no better way to celebrate I Love NYC Pets Month than by adopting a homeless cat, dog, or other pet from a shelter or rescue group. As was our intention six years ago when we first introduced I Love NYC Pets Month, raising awareness about the thousands of wonderful pets awaiting loving adopters is the number one reason we celebrate I Love NYC Pets Month.